Starting on Tuesday, November 3rd, 2015, ProtonMail was hit with an extremely powerful DDOS attack. The attack was highly sophisticated and has taken ProtonMail offline for several days. ProtonMail provides secure email to over half a million individuals around the world. Among these users are activists, journalists, whistleblowers, and other at-risk groups. In a day and age when our most personal data is sold to the highest bidder, our mission is to provide a haven where online privacy is respected and protected. With your support over the past two years, we have grown to become the world's largest encrypted email service. Over the years we have faced pressure from laws, government agencies, and others. Now for the first time, DDOS attacks are being employed to stop us from protecting privacy. This fight will not be easy, but it is one that we must win. What is at stake is nothing less than the future of the internet, and we will never stop fighting to secure that future. The attack conducted against us was the most sophisticated attack ever seen in Switzerland and displayed capabilities more commonly possessed by state sponsored actors. In order to defend against future attacks of this scale, we will need to utilize top-of-the-line solutions typically used by large companies such as Twitter, Facebook, etc. These solutions are unfortunately very expensive and can run over $100,000 per year. Despite the cost, we have already begun to implement them, but this has placed an unexpected strain on our budget. Given our mission, and the capabilities of our adversaries, it is necessary to invest in these technologies to ensure that online privacy can never be denied. With your support, we can ensure that ProtonMail is better protected against future attacks and can continue to provide privacy for all. You can also donate through Paypal or Bitcoin . 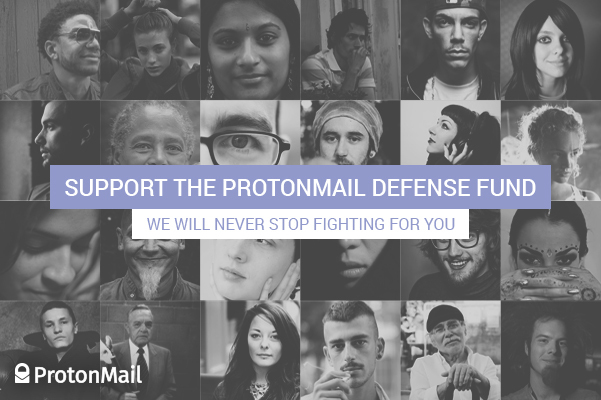 We would like to thank all of our supporters who donated to the ProtonMail Defense Fund! Thanks to your support, we have successfully protected ProtonMail from the massive DDoS attack which hit us last week. Your contributions have allowed us to implement a state of the art solution which will also protect ProtonMail from such attacks in the future. In total, we incurred approximately $56,000 of expenses in defending ProtonMail, including the estimated cost for defending over the next 12 months. Defense costs in subsequent years will actually be higher as the number of ProtonMail users continues to grow. Thus, even though we have hit our initial funding goal, we still need your support to build a comfortable financial buffer for unexpected emergencies such as this recent attack. Any surplus funds collected will be allocated to a Legal Defense Fund to protect ProtonMail against potential future legal attacks. To all the trolls: Protonmail is like the safe within a bank, but cannot be cracked. Now, if outside entities want to stop people from using the safe, they have to shut down access to the bank through other means, like DDoS. Protonmail is doing exactly what they should be, and even at my own personal losses, I support the cause fully. Premium services go against their entire philosophy - free and safe communication for all. If you want other services, use your brain and learn to do it on your own - like I do. But good luck when the Feds or whoever come knocking, unlike Protonmail - who will not subside. Keep up the good work. As an example to Protonmail's plight, please allow me to share a personal story. I manage an "Independent" artist and songwriter who obviously cares for peoples privacy and freedom by way of writing it in much of the music he composes. However, it's becoming increasingly difficult for him to continue doing this work, and because it's all on his dime he's only managed to offer "free" music at the cost of the quality in his recordings. So he offers every single song he's written for free due to his financial situation so people can get involved in his offerings and sacrifices to empower freedom and more. If you believe in something or feel good about something you invest in it, one way or another. If you can't donate money then share the link, write a blog, or just wish well to others offering anything remotely free, rights to privacy or alternative means. K. R.
Thank you for your great work, guys. Keep up the good fight. There are some serious opponents of effective encryption in both US and UK. It would be unlikely that such an attack was from street kids. Firms are being leaned on to not provide such services as seen today at http://www.telegraph.co.uk/news/uknews/terrorism-in-the-uk/11970391/Internet-firms-to-be-banned-from-offering-out-of-reach-communications-under-new-laws.html Attempts to prevent effective encryption have been stepped up since NSA whistle-blower Edward Snowden disclosed the extent and scope of their mass surveillance programs — including efforts to compromise or circumvent encryption. In reply to Theo Davis Mann: Interesting suggestion. I have been thinking that this attack is in fact quite timely, with ProtonMail still in beta. The attack is effectively (although inconveniently) a very high quality beta-testing regimen, which will ultimately make ProtonMail more secure, more robust and more popular - as ProtonMail's capacity for weathering such a mighty storm becomes more widely known. With this in mind, it's not a stretch to suppose that organisations other than belligerent Western governments might be behind the attacks. As you say, such organisations (I would be wary of bandying about the word "terrorist" - this is just a label applied by the US propaganda machine to those that it does not like, whilst the US itself is really the greatest purveyor of terror the world has ever known...) such organisations could benefit a great deal from the improved reliability and resilience of a service like ProtonMail. Some such organisation might, therefore, have decided to throw everything and the kitchen sink at ProtonMail in order to get it up to an acceptable standard for its own communications needs. On the other hand, the Western corporate-political-military juggernaut (or one of its agencies) might have decided that now is the time to nip ProtonMail in the bud, before ProtonMail becomes a permanent thorn in its side. They might be going all out to take ProtonMail down, once and for all - or maybe this is just their first salvo in yet another of their never-ending wars. Whatever the case, it's heartening to see such great support for ProtonMail. I am sure that ProtonMail will survive this onslaught and come out stronger than before, and that's a big win for humanity. I have to agree with Daniel, I understand their desire to want to change the world and NOT charge for it. But these attacks are costly as are defensive and offensive measures. They should start charging for Premium services so they can afford this. This sickens me to see people Attacking Protonmail. WHAT do you expect to get from it NOTHING you KNOW clearly you cannot Breech the Data so there is NO Breech and Clear there is ONLY let's Drop the Network. Come on people they are trying to provide a better level of security,, Proton and Jason you should consider dropping a Norse IPViking Box on the network also. Trust me the Data you can get from this thing is ALLOT more than anything else offers.. NO I do not work for Norse either.. Ever thought of using a solution like Cloudflare or Incapsula without spending hundreds of thousands of dollars? The U.S. Gov't, Google, and Facebook, all come to mind as potential attackers. Protonmail is a threat to their business model;free unmonetizeable, unsearchable email accounts. What I would potentially have a problem with is outsourcing our network security to a vendor who also works for US. Govt, Google, or Facebook, as that could potentially lead to backdoors. What if, instead of a premium service, you simply have a running ticker of money needed to keep providing your incredible services? This would allow people to fund as needed within their abilities, to keep you afloat and you wouldn't have to charge directly so all could have safe and private email access? More or less a "Progressive Tax System". Wäre es einfach, würde jeder einfach erreichen. Um so mehr herausgefordert, desto stärker müsstet Ihr werden! Also, dran bleiben, Leute! Today, so many legitimate mass protests are arrested when they hit the streets. We have to hit them where it hurts and we must compete with these powerful entities with a tool and weapon they understand: money. Cold hard cash contributed to our cause for freedom from illegitimate and unnecessary spying without just cause. Crooks and creeps are everywhere but to be labled thus simply by using encrypted e-mail is lying pure and simple. This is not Hitler's Thousand Year Reich nor the old Soviets' Russia. Please donate to maintain our privacy. Christopher Kirkby: There is no such thing as "free" on the net. Everything on the net is being paid for by someone. And as always, Sergei Krutov (creator of Scryptmail) just came to talk trash.. It's not facebook or google taking them down, that's pathetic to even imagine. They will definitely profit a LOT from this funding campaign which is sad, because then they are no longer offering anything for free. And just for the record, I'm all for ProtonMail and all the great supporters of this greatly needed institution. Pls help them fund necessary cyber defense systems...don't get me wrong! I just wanted to express my theory on this mystery and test the waters by hopefully hearing from some of the other folks who find this disturbing and have thoughts on the matter! Definitely concerning...on multiple fronts. However, while my first thought was similar to this seemingly consensus view (i.e. Big Brother - namely our own govt here in The States - wants to "sponsor" or collaboratively attack an important institution of privacy, while keeping their hands relatively clean...), but I could definitely see this as the perfect "fall guy" scenario and smokescreen for a clever enemy entity who thrives on the fear and confusion caused by more real definitions of the terms "attack, collateral damage, taking hostage...," etc. How [admittedly] clever would a group like ISIS be to an anonymously enlist top cyber group(s) to help create this situation, which doesn't stand out from other recent non-terror related cyber attacks- so as to remain out of consideration, because making this look like the "Power Nations" attempt to end anonymity - esp where they'd done so before (eg banking) - so that (1) anti govt sentiment garnered via attention of this oddly ongoing and unprecedented attack...hell, CERN's head of ProtonMail might as well have explicitly indicted the US and/or "Coalition Nations" based on his natural reaction... and (2) this go fund acct first led me to this possibility because whether it be via this, or pressure from users in wake of anticipated media storm, the conspirators HAD to assume attacking this kind of an entity would be followed by increased security measures... And who would either/both of these reactions and eventual results benefit most...? The US and other governments, who have the unlimited funding and hacking power (most likely beyond any "exhibition" ever seen, felt, or reported...or a terrorist group who, considering their impressive wealth and worldwide pockets of support, would be greatly relieved and further empowered by the fortification of a worldwide communications system that they no doubt employ to execute this new cyber-recruiting and globally funded type of terrorist revolution...? Bravo, but I'm not buying it. And no, I'm not a gun-toting Tea Partier...it just seems like a genius plan for one capable group, and a moronic (and likely unnecessary...) play by a Government in a lose-lose situation...?